The Syrian army is advancing towards the Turkish border, step by step, with wide-range air support from Russian military as the Kurdish armed group PYD also continue attacking the moderate opposition's strongholds along the Turkey-Syria border line. Mahmut Haci Hasan, commander of Al Baz Brigade, said the Russians attacked them with more than 80 T72 and T90 tanks and armored vehicles. He added that both Syrian army and Kurdish PYD are attacking opposition strongholds near the Turkish border to control the area. Regime forces have already taken control of Nubul and Zehra towns of northern Aleppo, cutting the Turkey-Aleppo corridor, which has been used for humanitarian aid supplies to the city. Hasan said the PYD and Assad regime are in cooperation and launching simultaneous attacks on opposition targets from all sides. The aim is to control the area between Azaz and Jarabulus, one of the most important and strategic points for Turkey's security and safety. Turkey announced the Azaz-Jarabulus line as the red line for Ankara and warned they would target any armed faction who tried to cross it. Assad's forces are advancing from Aleppo and Latakia, while PYD forces are launching an operation to take control of the area from both east and west. Those helping the regime of Syrian President Bashar al-Assad are committing war crimes, Turkish Prime Minister Ahmet Davutoğlu said on Thursday. "The root cause of this problem is the war crimes committed by the Syrian regime, and the war crimes committed by Daesh," Davutoglu told a news conference on the sidelines of a fund-raising conference in London. "Those who are helping the Assad regime are committing the same war crimes. I am especially saying this today because Aleppo is under heavy attack by Russian airplanes." He called on the world to stand against the crimes against humanity. He said that the humanitarian aid corridor between Turkey and Aleppo was closed due to Russian airstrikes. 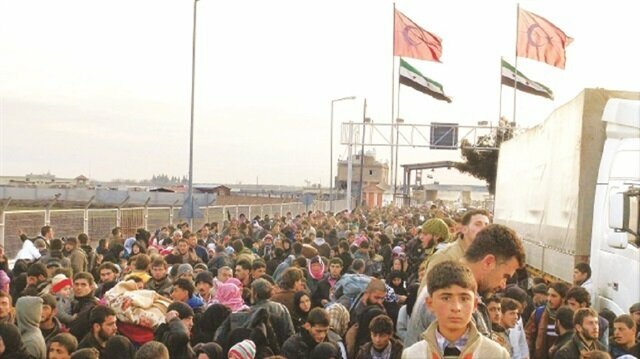 Around 10,000 civilians fleeing the Russian attack in Aleppo are currently waiting at the Turkish border in Kilis, Davutoğlu said, noting that around 60-70,000 people in camps located in northern Aleppo are headed towards Turkey. “Russia and Assad regime continue to kill civilians," said Davutoğlu adding that all conferences and meetings are meaningless as long as Russia continues its killing operation. “The international community requested us to convince the Syrian opposition to join the Vienna talks. We convinced them to sit the table, but what is the result?" Turkish primer said. He stressed on declaring ceasefire for getting output from talks between groups in Syria. Davutoğlu calls on US to take a more decisive stance against Russia over its intervention in Syria. He said Turkey is hosting more than 2.5 million Syrian refugees and spending millions of dollars on them. “But Turkey will continue to help oppressed people," he vowed. Despite a 10.4 percent unemployment rate, Turkey allows Syrians to work in many sectors, Davutoğlu said. Turkey sees the incidents in a humanistic manner, he continued, “and to do more for Syrians is our humanitarian duty." After seizing Dercimeyl village the PYD terrorists are advancing to Jarabulus from Afrin. According to sources from the ground, a senior Russian official held two separate meetings with PYD representatives in Kamishli and Afrin towns of northern Syria and they agree to fight together to besiege border cities. A little Syrian girl miraculously survived after her head was trapped under heavy debris of her family's home, which was collapsed in a Russian air strike. The toddler's head was crushed between the ground and a piece of rock while her body remained under the debris of the building, which was hit by Russian jet fighters. The incident occured on Wednesday, as Russian war planes were supposedly bombing Daesh targets in the province's Hureytan district. The 3-year-old writhed in agony until she was pulled out from under the debris of the building safely. Video: Syrian girl miraculously survives Russian airstrike She was able to stay alive despite long hours under the debris. Residents working frantically managed to remove the debris that squeezed her body. The injured girl was rushed to a nearby hospital by civilians, where she remains in the intensive care ward of the hospital for further treatment. Russian air forces have been bombing busy residential areas under the guise of counter-terror attacks since early October 2015. However, there is no sign of Daesh in the northern Syrian provinces including Aleppo, Latakia and Idlib. Intelligence reports say Russia's strikes only hit opponents of the Syrian regime, which has killed 400,000 people over the five years of civil war in Syria. According to the agreement, Russia will provide weapon support to PYD as well as air support to the group for advancing the area. Civilians will be forcibly displaced and then PYD-regime forces will launch a joint ground operation to capture the 110-kilometer-long Mare line, a red line declared by Turkey. On the other hand, regime forces and Shia militias also launched a ground operation in area between Aleppo and Başköy. The Russian military dropped at least 172 bombs in the area on February 3 alone. Turkish Prime Minister Ahmet Davutoğlu said Thursday at the London fund-raising conference for Syrians that a fresh influx of nearly 200,000 Syrians is headed for the Turkish border due to Russian airstrikes. At least four people were killed and another 60 injured on Monday by a series of Russian airstrikes in Syria's northern Aleppo province. 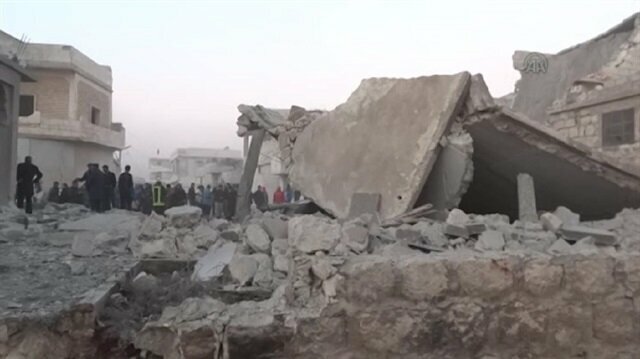 Civil Defense units in the city of Anadan (roughly 12 kilometers from the city of Aleppo), where the attacks took place, told Anadolu Agency that Russian warplanes had carried out a total of 20 airstrikes in the area. Several residential areas were badly damaged by the strikes, local sources told Anadolu Agency. Mohamed Kurab, an activist based in Anadan,told that following the attacks, Civil Defense units had to pull the bodies of the dead and injured from the rubble of destroyed buildings. According to Kurab, local residents in northern Aleppo are afraid to go out due to ongoing Russian airstrikes.